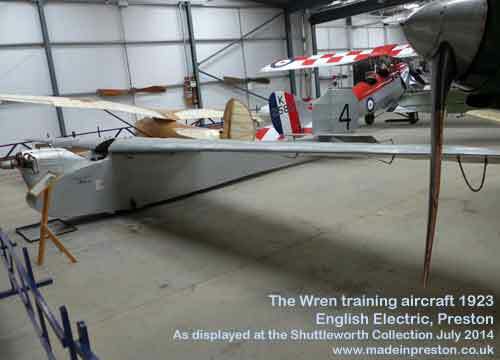 The English Electric Wren first flew in 1923. It was bult to meet a training requirement and flew for 85 miles on one gallon of fuel. However its performance was inadequate and only three were built. The one in the photo is at the Shuttleworth Collection near Bedford. It was stored in Dumfries and after restoration by English Electric and some parts from the Science Museum it flew in 1957. It was then further restored by British Aerospace at Warton in 1980 and flew in 1983. Using a bungee it flew again in 1992. Bungee launches are now regularly done.